Join us. Thrive. Buy JojaMart. JojaMart is the big, scary corporation that serves as the ‘bad guy’ of Stardew Valley, as far as anything in the game can be considered ‘bad’. 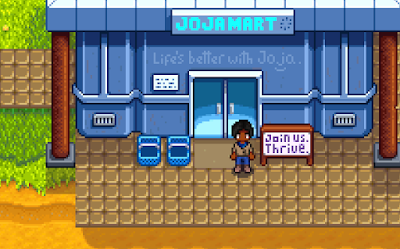 Positioned in the far east of Pelican Town, just north of the Blacksmith and Library, JojaMart is an alternate store for purchasing Seeds and other items - though its items virtually always cost more than the same stock at Pierre’s General Store. JojaMart is open from 9 am to 11 pm each day. As such, it’s open a great deal longer than Pierre’s, making it the only option for late-night purchases. The primary function of Jojamart in the average playthrough is that of store. Speak to the female cashier near the entrance to make your purchases. Like Pierre’s General Store, JojaMart’s stock changes from one season to the next. 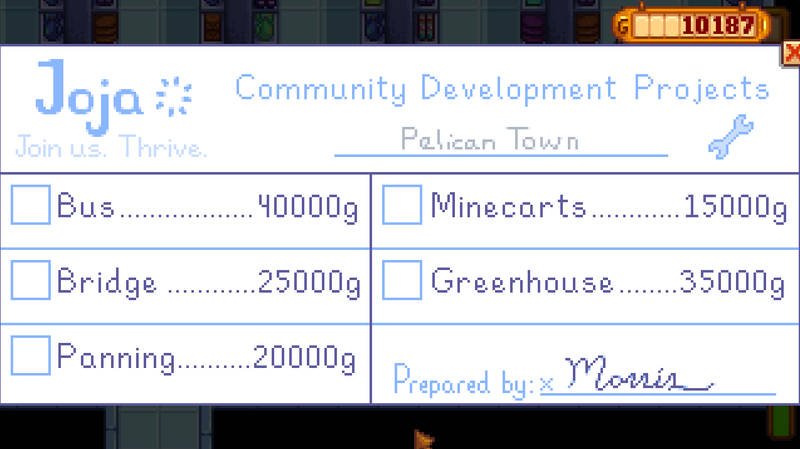 Not long after you begin Stardew Valley you’ll be introduced to the Community Center by Lewis when you visit Pelican Town. Once this happens you can participate in a long series of fetch quests to restore the Community Center to its former glory, receiving a string of bonuses - including some vital fixes to several services - in the process. Bus. For 40,000 gold you can repair the bus parked at the Bus Stop one screen east of your farm. You can then ride in the bus to Calico Desert, a side area with lots to do. Minecarts. For 15,000 gold you can repair the minecart system that runs through Stardew Valley. The minecarts connect the Bus Stop, the Mines, the Blacksmith shop, and the Quarry. Fast travel made easy. Bridge. For 25,000 gold you can repair the bridge to the southeast of the Mines. The bridge leads to the Quarry, where you’ll find a massive number of regenerating rocks. These rocks may offer up valuable Minerals and Ores. Greenhouse. For 35,000 gold you can complete the Greenhouse on your property, west of your house. You can plant crops at any time of the year in the Greenhouse, regardless of when they would normally grow. This means you can also grow crops during the Winter. Panning. For 20,000 gold you can have the large boulder beside the Mines destroyed. This will allow you to pan the streams of Stardew Valley with a Copper Pan, which you’ll receive when you go to inspect the remains of the boulder the next day. 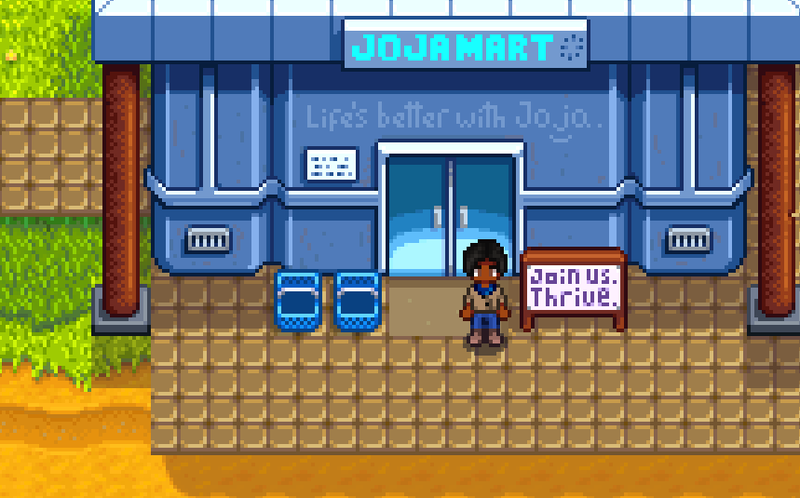 If you manage to fund all five Development Projects you'll see a scene with Morris outside the Joja warehouse the day after the final initiative is completed. You'll receive a Soda Machine for your help. The Soda Machine will generate Joja Colas periodically.